We are frequently bombarded with pictures of a bleak and catastrophic future composed of natural disasters, nuclear wars, cyber attacks, climate change, financial crisis… but beyond the constant stream of negative news and chaos, there do exist many solutions to the world’s most pressing issues. 50 news media, from across the globe, have decided to take action and tell these stories of solutions: each year, they join their forces to find the most innovative and promising initiatives in their respective countries, write about them and then offer their readers to discover an all too often hidden reality. Telling these stories helps build a more inclusive and resilient world. Help us source and spotlight the most promising positive initiatives. From today through until Match 5th, journalists and relevant networks such as incubators, universities, governments and international organisation from all over the world are launching an international call for projects to find initiatives that best help achieve the 17 challenging UN Sustainable Developments Goals embraced by 193 countries. These include ending poverty in all its forms and promoting inclusive economic growth, taking urgent action to combat climate change, ensuring quality education for all and promoting more peaceful and inclusive societies. 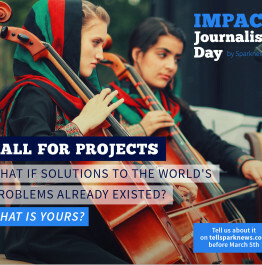 The newspapers taking part in Impact Journalism Day* on June 16th 2018 will select and publish stories from amongst the most innovative, promising and with a high environmental or social positive impact solutions to describe a world where hope, resilience and sustainability are possible. What is the impact for the projects featured? By sharing these stories, the media help their replication across borders and get a broader positive impact on the environment and society. According to the Sparknews impact study of the 2017 edition, 30 percent of projects surveyed achieved connections with new partners and/or clients, 15 percent of projects surveyed were contacted for replicating the project in other regions or countries. Furthermore, this year, if the project addresses an environmental issue, it is automatically participating in Fondation Famae's challenge through which it could win the Sparknews by Famae award worth 20,000 euros. Fondation Famae has launched a 1 million euro competition dedicated to the environment and open to all. Individuals, NGOs and social businesses can send their application for potential publication.